Thank you so much for all your help. 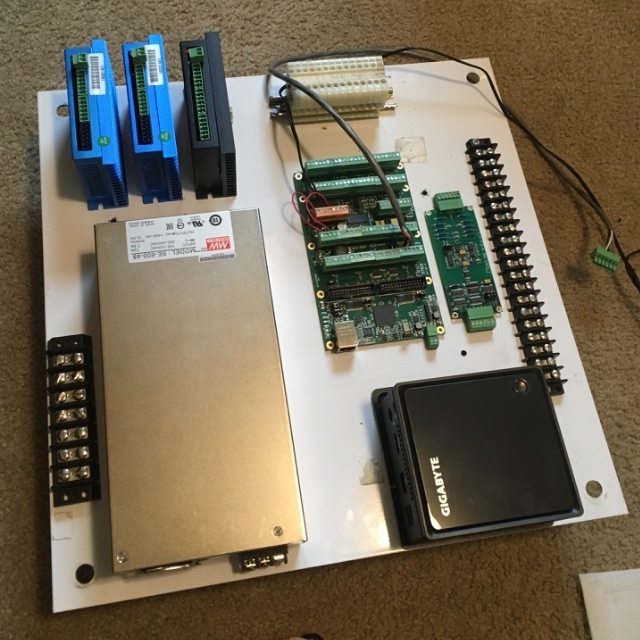 i do have a working ini and hal file but it was just put together to connect to the 7i76ed and test my stepper motors. I have not connected the thcad or any of my limit switches yet. still muddling my way throught that. I thought I should move to posting on this thread rather than the THCAD-10 thread I originally started on, as I am now working with the Plasmac component. I had got to the position of having a run in place Plasmac side by side the existing 2.7 installation that is in use on my table, but lacks THC functionality. The plasmac sims were available and usable. I have eventually managed to get a couple of hours spare to look at moving this to production use on my table and believe I have managed to get the .ini sorted out. unfortunately with the hal I am again stuck due to my lack of knowledge on linuxcnc. My setup is mesa 5i25 - 7i76 - thad 10. I am unsure just what I need to add to the plasmac.hal file to get things working, I did start to add things to the mode 1 section but don't think what I have done is correct. I have attached my plasma.hal and custom hal as well as the plasmac.hal any help would be appreciated. Last edit: 16 Apr 2019 16:17 by Dee436. Please post the working .hal files and .ini files from your working configuration if the ones you posted are not. Are you using a float switch for IHS? I can see that you are falling victim to the usual 2.7 to 2.8 gotchas concerning multiple spindle support in 2.8. Look in the docs for the master branch and this will all become clear as mud. I will fix you up with close to working config after work today. The table I have was built by me and is a pretty standard gantry type plasma, where it is a little different is that I only have one motor on the gantry (Y axis). I basically have a rack on each side of the machine connected to belt reductions gearboxes which are joined by a jackshaft so it is xyz rather than xyyz. Ohmic sensor as yet unconnected. Torch breakaway switch connected in series with the E-stop as I could not work out how to connect it separately in LinuxCNC. IHS is via a floating switch and uses the probe in, and a G-code routine. I am using the table and have cut lots of parts, homing, probing, and everything else is working fine, I just have no THC, hence the move to plasmac. Last edit: 16 Apr 2019 18:30 by Dee436. After I get off of work tonight lol. I will then have a better idea on my inputs and outputs. Please find attached machine.hal and darrens_plasmac.ini for your system. They should be close but carefully check all motion and torch controls. I have never used AXIS so this is a bit of an unknown to me. Always start your new configuration from a (new) terminal after setting the RIP environment so you can get the errors reported. We will need those cut and pasted into <code> </code> sections in your forum posts to help you. First make sure your plasmac branch is up to date. There were updates posted this weekend. You will need to fix the Z to Top and Load Sheet buttons for your machine in darrens_plasmac.ini before using them. Only use an unmolested plasmac.hal file, I have put all the connections to your machine in machine.hal. You can connect your break away switch to it's own input every thing is waiting for your hardware pin in machine.hal. Plasmac will take care of a break away. You can connect ohmic probe to it's own input every thing is waiting for your hardware pin in machine.hal. Plasmac will take care of the ohmic probe if used. Please give these a sanity check as I have never used Axis or a metric machine. Last edit: 16 Apr 2019 23:55 by islander261. Thanks for your time in helping out with this. A couple of things in the ini file. Thank you, I was sure that I'd missed something because I don't have the hardware to test. I believe that your branch should be very attractive to newbie plasma cutters because of the simplified PP required and the fact that it will work with Gcodetools with little modification. A newbie setup guide will be helpful but a lot of work given the pace of evolution in your branch right now. Actually all the instructions needed are on the forum with a little looking, I fully realize that searching a forum for information you don't even know you need is pretty daunting. Last edit: 17 Apr 2019 01:10 by islander261. I have done a torch-enable in the component and removed dry-run. I have also done this for Gmoccapy, it reduces the user buttons to four from the original five. I am hoping you will be able to test it and see if I am on the right track before I change the other GUI's and push to the branch. - New plasmac.comp which you would need to compile as before. Thank you, I will try and get some testing done tomorrow. I finished my semi annual slat repair and clean out this morning so the table is ready for use now. I am sure that I can get a sheet parts CAMed in the morning.